The Professional Regulation Commission (PRC) recently announced the schedules of Oath Taking Ceremonies for the successful passers of Civil Engineering (November 2017 board exam), Psychologist and Psychometrician (October 2017 board exams). According to the commission, the new Civil Engineers Oath Taking schedule will be on December 16 this year and the venue is at Philippine International Convention Center (PICC) in CCP Complex Roxas Boulevard, Pasay City. The Board of Civil Engineering will administer the upcoming ceremony and it is very important for the passers to follow the guidelines. Based on the published information through the official website of PRC, the allocated time will be from 9:30am – 12noon (alphabetical order by surname A-J) and 1:30pm-5:00pm (alphabetical order by surname K-Z). As for the Oath Taking Ceremony of the new Psychologists and Psychometricians, it will be on December 9, 2017 at the Plenary Hall of PICC as well. The Board of Psychology will administer the scheduled ceremony and all passers need to check their allocated time. For the Psychologists, the ceremony will be from 9:00am until 12:00 noon. For the Psychometricians, there will be an Oath Taking from 9:00am-12:00 noon (in order A-G) and 1:00pm-5:00pm (in order (H-Z). All of the inductees and visitors will need to wear formal attire as the required dress code, as detailed by the commission online. 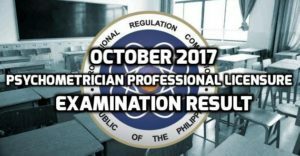 The results of the October 2017 Psychometrician Professional Licensure Board Exam are available as revealed by the Professional Regulation Commission (PRC) on November 7, 2017. The examination took place last October 29-30 and according to the commission, 8,701 took the board and 4,957 passed successfully. The designated test centers include Baguio City, Cagayan de Oro City, Cebu City, Davao City, Iloilo City, Legazpi City, Lucena City, Manila, Tuguegarao City and Zamboanga City. The Board of Psychology of the PRC administered the examinations and headed by Ms. Miriam P. Cue (chairman of the board), with the assistance of the designated members of the board. As detailed through the official website of the commission, it is important for the passers to register online from November 22-28, 2017 for the Professional Identification Card and Certificate of Registration issuances. They also need to check the required documents and further instructions by the PRC.